Don’t you hate it when water seeps out of your shower? You have to mop up the floor every time you hop out of the shower. 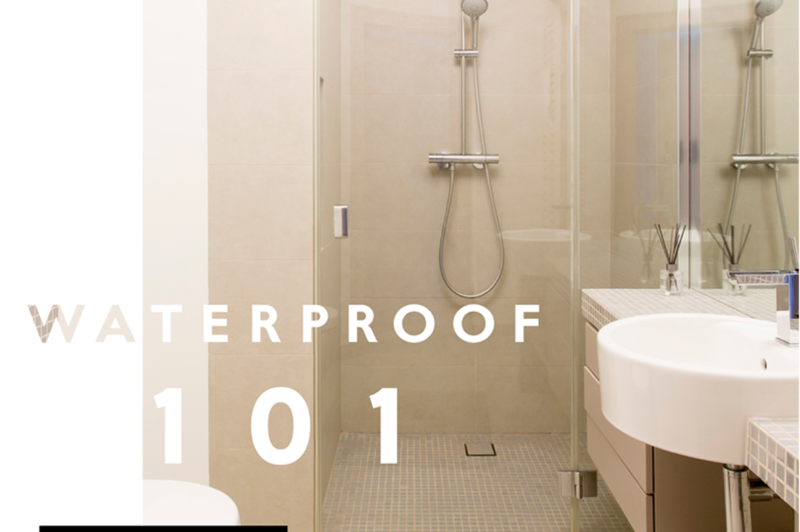 Mica Hardware has you covered with our how-to on waterproofing your shower! Scutching hammer (optional) or bolster to remove any tile and/or tile adhesive remains. TAL Floor Primer or TAL Floorkey. Silicon suitable for the bathroom – when purchasing this product check the packaging for temperature limits. Hot water geysers in SA should be set to about 55ᵒC, but some may be set higher. Remove the existing tiles and all tile adhesive from floor, walls and the sill. Rather than washing it out, vacuum it up – then you don’t have to wait for it to dry afterwards. Ensure that the surfaces are all free of any debris or patches of adhesive, as the latter could prevent you from placing a tile/s properly. The substrate must be in good condition, clean and dry. Prime rough, porous surfaces with TAL Floor Primer and smooth dense surfaces with a TAL Floorkey slurry coat (one part TAL Floorkey to two parts tile adhesive powder or 1.5 parts ordinary Portland cement, by volume). Paint the primer onto the surface, including into the floor waste, using a block brush, and allow to dry completely before proceeding. To allow for movement, apply a 10mm silicon bead in all internal corners and joints around the waste pipe or floor waste and around the tap and rose plumbing. Apply the first coat of TAL Superflex1 to these areas. Immediately bed the TAL Superflex1 Membrane, 200mm wide, into the wet Superlex1, ensuring that there are no wrinkles or air bubbles trapped beneath the membrane. The membrane must be pushed into the corners, ensuring that the entire interface is covered with Superflex1 Membrane. Apply a second coat of TAL Superflex1 to completely saturate the membrane before the first coat dries. Apply a coat of TAL Superflex1 up the pipe and immediately bed the TAL Superflex1 Membrane into the wet TAL Superflex1. Apply a heavy coat of TAL Superflex1 over the membrane to completely saturate the membrane before the first coat dries. For wastes that are flush with the floor, take the application down into and around the waste or use the puddle flange system – a type of drainage installation (check local council regulations). Apply the first coat of TAL Superflex1 over the primed surface. Immediately bed the TAL Superflex1 Membrane into the wet Supeflex1. Ensure that there are no wrinkles or air bubbles trapped beneath the membrane and that the membrane is adhered to the substrate by pressing the membrane with the roller in two different directions. Apply a heavy coat of TAL Superflex1 over the membrane to completely saturate the membrane before the first coat dries. Ensure that the main application overlaps the corner and floor waste applications by at least 50mm. Allow the Supeflex1 system to dry completely (at least three days, depending on ambient conditions) before tiling is commenced. In passing, when retiling, ensure that the surface under the floor tiles – often supplied in mats of small tiles – the ones in the attached image are 70mm x 70mm – is completely covered with adhesive to the same depth throughout so that all the floor tiles are fully supported over their entire surface. (Some people try to save on adhesive by applying it in patches – not a good idea where any tiles are concerned – even wall tiles.) If you are going to use larger tiles or some other surface, check beforehand to confirm that they are non-slip. Get to Mica Hardware for all of the tools and products you will need to waterproof your shower and never have to mop up the floors after your shower again!